Back River – Chesapeake Chapter U.S.L.H.S. Back River Lighthouse was built in 1829 by Winslow Lewis of Boston at a cost $3,500 plus an additional $750 for his own lamps. It was constructed on four acres of land six miles north of Old Point Comfort between the Back-River entrance and the Grandview area of the City of Hampton, Virginia. It was a thirty-foot-tall, conical, whitewashed brick tower with wooden steps. The original lantern contained Lewis’ own design of ten oil lamps with ten, fourteen-inch-long reflectors. A one and one-half story, thirty-four feet by twenty feet, whitewashed, brick, keeper’s house was built at the same time as the construction of the lighthouse. A 144-foot-long footbridge was also built to span the marsh and connect the keeper’s quarters to the tower. In 1855, the installation of a new revolving machine containing six 21-inch parabolic reflectors and six fountain lamps help improve the light. It contained six twenty-one parabolic reflectors and six fountain lamps. During the Civil War in 1862, Confederates vandalized and destroyed the light. At the same time, the wind and waves were taking a toll on the tower. The keeper’s house was enlarged in 1894 with the addition of a second story. In 1903, a storm destroyed the concrete wall around the keeper’s dwelling. Construction of a 459 feet long bulkhead was started along the front and sides of the house. 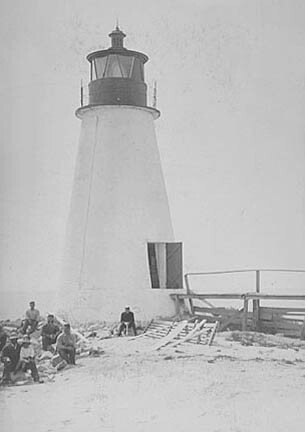 Approximately two weeks after this construction started, a severe storm hit in October, almost destroying the keeper’s dwelling and walkway to the lighthouse. The construction crews worked non-stop for three days to save the house and walkway so that the light could be maintained. Waves fourteen feet high slammed against the keeper’s house, moving some of the large riprap stones near the lighthouse. In 1914 the keeper’s quarters was sold and dismantled. In 1915 the light was automated, and it was decommissioned in 1936. Over the years the lighthouse began to deteriorate. The remaining structure was destroyed during Hurricane Flossy on September 27, 1956 with only a pile of rocks marking the site today. 2. Official Register of the United States, various years. 3. Forgotten Beacons, Patrick Hornberger & Linda Turbyville, 1997.